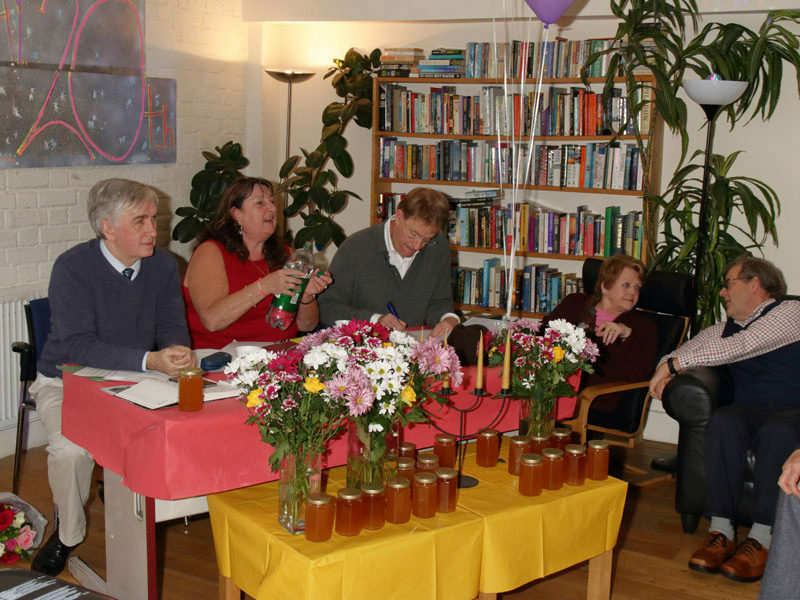 Top team: Kairos Trustees and staff, with jars of Kairos’s own honey in the foreground. Man of the match: Kenny Brown with his award, Chinapa Aguh and Mossie Lyons. Thank you for all your work… Paul Carter, Hanora Morrin and Mossie Lyons. Contraband in rehearsal for the AGM. Tuesday night and the lights were on at Linden Grove, reports Tim Penrice. Contraband (Manni, Becks, Jacqueline, Michael, Tommy, Rikki and Vince) greeted guests with five new songs as pennants and balloons danced to the rhythm. The Kairos AGM was underway again and kicking off in the familiar style that mixes the serious intent of the evening with a celebration of recovery and success that infuses most Kairos events. The new chair of our Trustees, Paul Carter, took the microphone to welcome everyone and to thank Linden Grove manager Lorraine Beckford, the band and all volunteers and staff who had put the show on and provided the buffet. 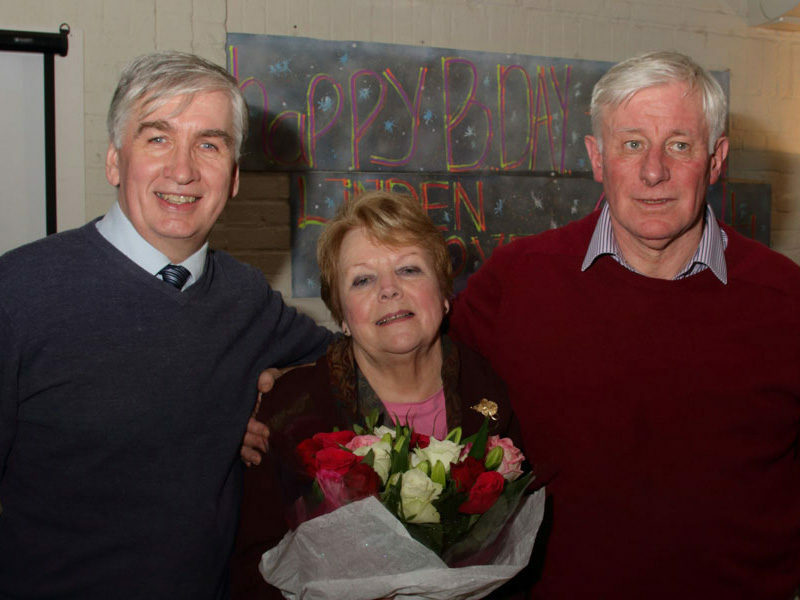 Special thanks and a personal tribute went to Hanora Morrin for all her service to Kairos as Paul’s predecessor as chair, and a huge bunch of flowers went some way towards expressing the communal gratitude felt. Trustee Robert Finlay started his financial statement saying that Kairos had enjoyed a successful year as we now owned 19 of our 32 buildings. He expressed his gratitude to Financial Controller Oye Oke and her team for their accounting efforts. WSM Auditors Ltd were proposed, seconded and re-appointed as company auditors. The tone of the evening turned to addiction and recovery when Sandy R gave us her powerful story of experience, strength and hope. This was followed by Rachel Henry from Community Southwark Support for the Voluntary Sector. She gave a brief overview of the recent pan-Kairos review exercise that took place this autumn. Her full report will be available in the New Year. Paul introduced the main speaker of the evening with his tongue firmly in his cheek as he announced: “Mossie – the man – the legend”. Mossie’s wide ranging review of the busy past year started with support for Kairos service managers, reminding us all of the difficult times the recovery industry is experiencing with the closure of 63 rehabs in the past two years. He reiterated his central directorial message about the necessity of Kairos having a charitable heart and a commercial mind. His serious tone carried him into acknowledging the Kairos lives lost this year: Jon Pankhurst, Paul Dupont, Marie McClennan, Grainne Curley, Paul Lawrence, Peter Goddard and Patricia O’Sullivan. The first ever Kairos wax candle from this year’s bees was lit in remembrance. The Kairos archive and website and the work of Marsha Dunstan and Rory O’Connell were recognised, as were the contributions of Ben Lucas who slept out, John O’Sullivan and Shaun McCarthy for organising another charity golf day, Vintage Fashion, CRASH – the Construction Industry charity, and Kairos resident Tarquin who is running the 2019 London marathon for Kairos. All were graciously thanked for the wide variety of help, support and generosity of spirit they had given Kairos and the community. Mossie mentioned the New Hanbury Project and the excellent relationship Kairos has developed over the years with this Spitalfields Crypt Trust occupational therapy project. He pointed to the recent success that Robert Druce had enjoyed selling six of his paintings. He also brought to our attention the work that Micheal Croft and his team of volunteers has been involved with in the Recovery Shed venture. This new project is about trying out new practical and creative skills and upcycling furniture and is based in Kairos sheds in Brent, Bromley and Southwark. Mossie introduced Gerry Bennett, ‘head bottle washer’ who helped organise the annual Kairos trip to Lourdes. Ten years ago, six volunteers accompanied the annual Oblate pilgrimage of the Anglo-Irish Province; this year 36 went. Gerry spoke movingly of the immense contribution that the Kairos team made in their support of sick pilgrims and thanked them by saying that empathy and gratitude were the outstanding characteristics of all the Kairos personnel. The final important piece of business was the presentation of the annual Award for Outstanding Service to Kairos. 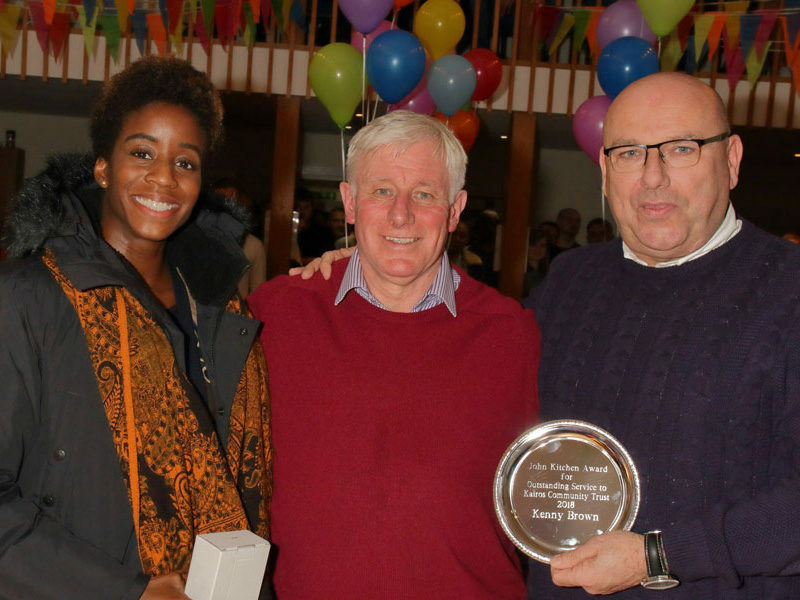 Chinapa Aguh who organises the Kairos trips to Medjugorje was called upon to give Kenny Brown this richly deserved and popular accolade. 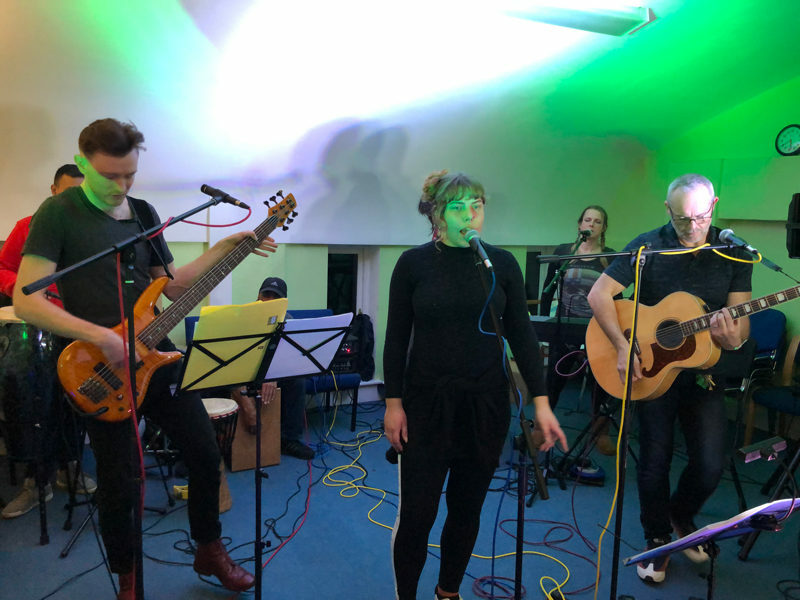 In all the excitement Mossie nearly forgot to mention that Kairos won the Southwark Community’s Charity of the Year award 2018, and as he said goodnight, the Contraband said hello again, and live music and good food and fellowship followed.